Get covered in powder paint for a good cause! If you think you need a little colour in your life, then sign up to get blasted with powder paint while you run to help those with life-limiting illnesses. Rennie Grove Hospice Care’s brand new event will turn runners into rainbows as they are showered with coloured powder paint as they make their way round the 1.5km or 5km routes on Sunday, August 23. 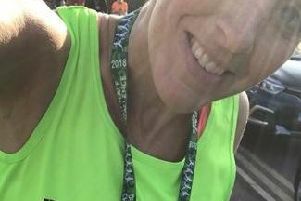 Mother-of-two Joanne Neale has already signed up, saying: “It’s one of my New Year’s resolutions to take part in a running event as I have never run in one before, and Colour Blast sounds like a lot of fun without taking itself too seriously. “I have two small children and could do with getting myself back into shape, so this seemed like a good reason to get fit. “Running is so much easier to fit into your lifestyle when you have a young family, as you can do it in your own time rather than commit to exercise classes or go to the gym. “A few of my friends who’ve also had babies recently and felt like they needed a challenge agreed to join me, so we are thinking of calling our team the Yummy Mummies! “I have always been a bit wary of serious running events as I don’t want to feel pressured to run particularIy fast, so Colour Blast sounds perfect. Colour Blast is happening at Westminster Lodge, St Albans, from 10.30am and is open to all ages, but under 18s must have parental consent and under 16s must be accompanied by an adult. Registration is £20 per adult, £10 per child and a £50 family rate is also available (two adults and two children). Under fives go free. Special sunglasses will be provided to protect the eyes, but all powder is safe, non-toxic and is corn starch based. The entry fee will cover the costs of putting on the event and includes your Colour Blast sunglasses and medal on completion. All participants are asked to seek sponsorship to support the Tring-based charity’s services. Colour Blast sounds like a lot of fun without taking itself too seriously. Visit www.renniegrove.org/colourblast or call 01442 820740 for more information. But before you put your hand up to get covered in paint, why not get your knitting needles clicking? This Easter, the charity would like its creative supporters to make cute Easter egg cosies to raise money to support the services it provides for local patients diagnosed with cancer and other life-limiting illness. As a way of raising funds, the charity has found some gorgeous patterns to help people create either bunny or chick Easter egg cosies. Community fundraising manager Penny Crosswell said: “We had a great response to our Easter knitting fundraiser last year and we are hoping to do even better this year. “Both the chick and the bunny egg cosies are the perfect size for a small chocolate egg. Last year, the charity’s Easter knitters helped raise more than £1,500 by selling the egg cosies for a suggested donation of £2. This was enough to fund nearly 80 hours of specialist nursing care. Patterns are available to download at www.renniegrove.org/eggcosies. Anyone with queries should contact the community fundraising team on community@renniegrove.org, or call 01442 890222.